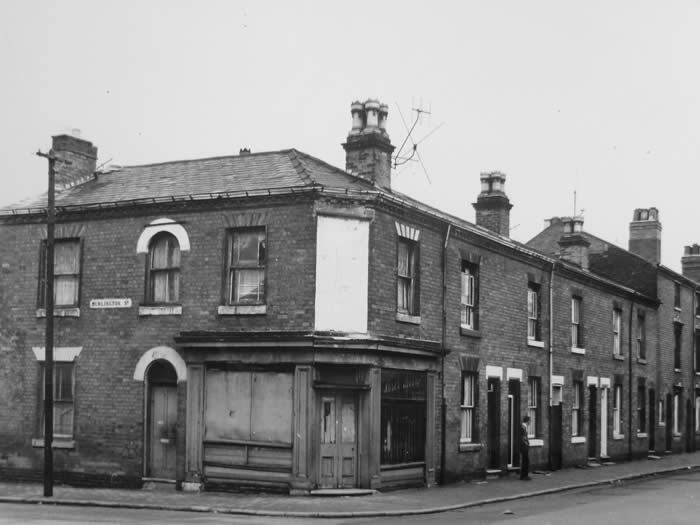 In the years prior to moving to Parliament street there was a pawnshop on the same corner.The name of the owner was Mrs Kate Payne her address was 137 Park lane and Parliament street, this was a large building and also a large yard at the rear the house part was No 2 Parliament street.The shop was later bought by Roly Morriss the ex Aston Villa player he sold floor coverings Roly lived in Clarendon Street. My parents Arthur Leroux and Edith Mary Keight were married on the 18th. 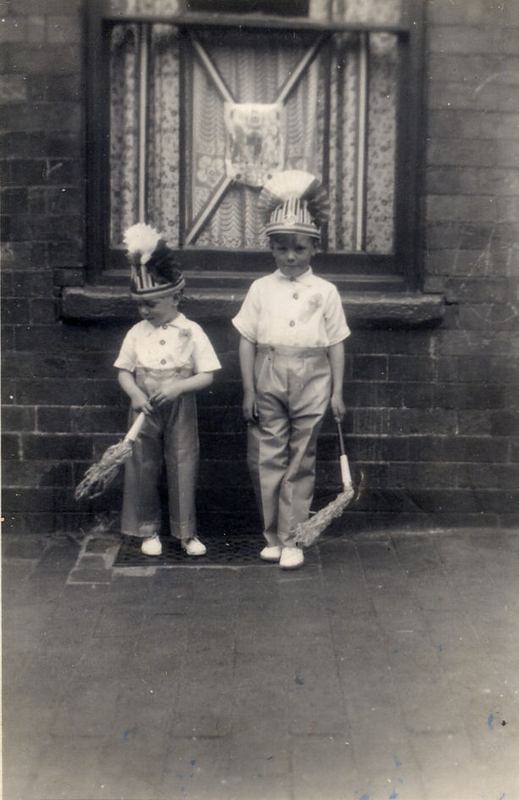 July 1942 at St. Mary’s Church, Aston Brook. My dad was from 14 Chattaway Street in Nechells and my mum was from 143 Park Lane in Aston. As it was wartime, my dad was serving in the army in Shrewsbury, this left my mum to decide on the house where they were to live, luckily her aunt Gladys Keight was able to help her. No.7 Parliament Street became available and the decision was made to rent it. On the 21st. 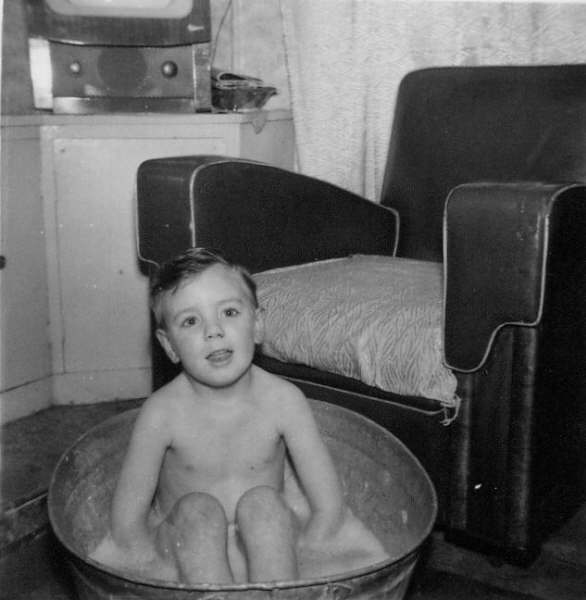 November 1945 their first son Arthur Jeffrey (Jeff) was born, I was born four years later on the 22nd. July. We both attended Burlington Street School just around the corner from our home. This had also been the school for most of my mother’s relatives. It is difficult for me to instantly remember all of the teachers’ names but there are some names, Mr. Burgess and Miss Rock that spring back to mind. I have no bad memories from my time at Burlington Street School, not even from my first day. I can only assume that it was comforting to know that my elder brother was at the same school. Something that I can remember vividly is that one morning running to school (most likely late) I crashed against a telegraph pole outside the school and knocked myself unconscious. When I came round I was taken home to have butter rubbed on the bump on my head. Now that I have lost my hair, I realise I have a lasting reminder of that event, the bump is still there. An incident soon after starting school has been engraved in my memory. I had to suffer the embarrassment of being called out of assembly by the headmaster one morning, at the request of my aunt Gladys. I had been in hospital for a month with kidney problems and was supposed to wear an insulating bandage around my stomach, this morning I had decided not to wear it and aunt Gladys had arrived at the school very angry and determined that I had to put the bandage on there and then. God bless my aunt Gladys. Christmas at any school is always a magical occasion; it was no different at Burlington Street. My claim to fame was playing the part of a shepherd in the nativity play; this was the first and last time that I put myself through this type of public ordeal, in later years I would take the proverbial one step back at volunteering stage. Like the majority of families in Aston, mum and dad were not well off, nobody that we knew at the time had a car, my first memory of travelling in a vehicle (other than a bus) was in the coal lorry that belonged to the uncle of the family ‘1 back of 9’. 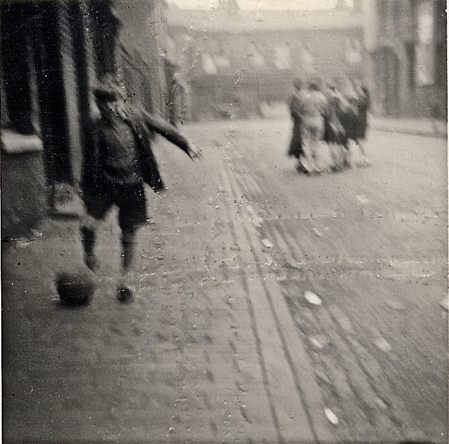 Our pastimes as children were simple but we never tired of them. Games such as hop-scotch, leap-frog and marbles, most probably everybody knows and has played at some time. Tracking involved breaking up into two ‘gangs’, the first gang went off leaving a trail of chalked arrows behind them on the pavement. The second gang had to count to 100 before following (of course both gangs cheated, the first would leave arrows pointing in the wrong direction and the second gang would only count to 50). When finally reaching their chosen destination the first gang would wait there until found. Bear in mind we were probably only 6 or 7 years old and would travel miles, it is unimaginable nowadays that a mother would allow her children to be out of sight for such a long time. Our house backed onto a courtyard running from Park Lane, dad and a neighbour had built a six foot wall to divide our back yard from the courtyard and the wall had broken glass set into the top of it. There were two pitched (tiled) roof toilets in the back yard (shared by four families) these were right at the end of the yard with the doors facing the wall. The roof was the gathering place for ‘out of site’ meetings, we would shimmy up the gap between the toilets and the wall and we were never disturbed. A certain amount of dexterity was required to avoid major injury on the broken glass; this left the soles of our shoes to take the brunt of the damage. From this roof it was possible to see into the courtyard and the playground of the school. A short but perilous walk along the perimeter wall of the school (clinging to the chain-link fencing) enabled access to the school playground (only when the school was closed) and consequently it was an ideal ‘out of hours’ football ground. We were fortunate to have some toys: Dinky cars, board games, Triang clockwork train set and others (I wish I still had the boxed train set, how valuable it would be now). 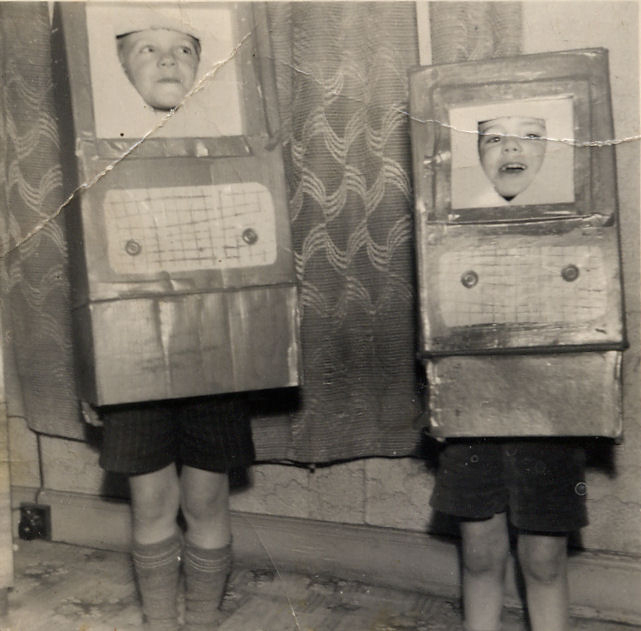 These were different times (no playstation or Wii) we spent a lot of time outside making our own entertainment and fairly harmless mischievous activities although some of them are probably better left untold. The back to back house had two bedrooms (one of these located in the attic), a living room about 10ft x 10ft and no such thing as a bathroom. The kitchen, which was the size of a broom cupboard contained just a sink and tap, opposite the sink were the stairs down to the cellar (dad had put a gate at the top of the stairs to prevent an unplanned trip to the cellar, if taking one step back from the sink). The cooker was in the living room at the bottom of the stairs leading to the bedrooms, to this day it astounds me that mum was able to prepare the ‘sumptuous’ meals that we had. Lamb stew was her speciality, even before starting to eat the meat and vegetables most of the broth had been consumed with the aid of considerable amounts of bread. On special occasions we had faggots and peas, I was sent to the shop just around the corner on Park Lane, I am not sure who this belonged to but it was either Whittakers or Dunns. I still love faggots to this day but unfortunately they are not as good. Everybody seemed to have numerous aunties and uncles and in a lot of cases it was more a term of endearment than actual blood relations. Aunt Floss and uncle Jim next door at No. 5, uncle Albert and great aunt Gladys at 143 Park Lane (the bicycle shop) and aunt Emily and uncle Charlie at 145 Park Lane (the newsagent). These so called ‘aunties and uncles’ were always on hand to look after us, it was almost like an unwritten code that neighbours ‘looked out for each other’. I consider myself very lucky to be able to consult my mum with regard to points that I cannot remember well. My mum will be 89 this year (2009), currently living in Cannock, she is still very fit, active and healthy enough to look after her grand-children on a regular basis, sadly my dad died in 1996. Together they raised four sons (Jeff, John, Stephen and David), all were born in Birmingham and have been reasonably successful in their lives. Times have changed and for families to live in the same area is no longer the norm. We live some distance apart, Tewkesbury, Lichfield, Penkridge and Leek but we still remain a close family. I was 8 years old when we left Aston to go to Washwood Heath but I will never forget my roots and the character building experiences of living in Parliament Street. It is unbelievable that this blurred and dog-eared picture of Parliament Street is the only one that exists, or is it ? My mother would love to hear from any of the older residents of Parliament Street, in particular members of the Williams’ family that lived at No. 3. I am indebted to John Houghton and Mike Ingram whose fantastic website has rekindled the memories that I have recorded.